It has often been told to yours truly that many collectors of United States stamps throw their hands up in despair once they get to the classic era. 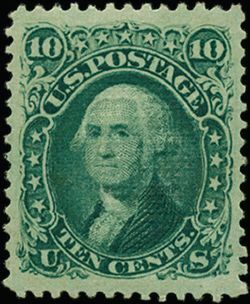 One main area of consternation is that of identifying many of the “look alike” types of early U.S. stamps. Many useful reference works exist but sadly many others are well out of print. One example of the latter is the book Notes on the Grilled Issues of the United States by noted philatelist Lester G. Brookman. Triad reissued this work over a quarter century ago and I recall selling copies in my store for about $10 if my aging memory is correct. Copies may still be available from leading philatelic booksellers such as Jim Lee or Leonard Hartmann. It is of grills that we will speak of today. I used this book to the point where it became ragged after less that a year of use and had to be replaced. Thankfully I still had some copies on my sales shelf. Another valuable area of learning for me was the monthly “Philatelic Roundtables” held prior to meetings of the Collectors Club of New York. Herman Herst, Jr. sponsored me as member in the very early 1980’s. At these “Roundtables” many luminaries, such as Herbert Bloch and Ernest Kehr to name but two, attended regularly. These now gone, but never- forgotten, old-timers were only too pleased to share their wealth of knowledge to those willing to learn. From notes taken from sources just mentioned, I devised a short primer for myself on learning how to distinguish the various grill issues. Now I’d like to share them with you. A little bit of history is in order first. 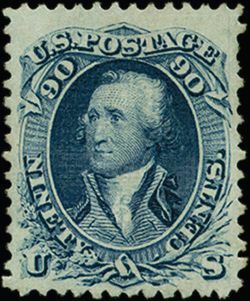 In the decade of the 1860’s the United States Government became very concerned about the possible cleaning of cancels and subsequent reuse of postage stamps. During this same period the government failed to provide the smaller post offi ces with canceling devices, thus it was common practice for postmasters to pen-cancel the stamps on outgoing mail. With the application of a little bit of ink eradicator, the stamp was cleaned for reuse. Some enterprising souls went a step or two further and found ways to remove the grid cancels as well. Something had to be done, and quickly, to stop this chicanery. Many clever devices sought U.S. patents and chief among them was what we know today as the “grill”. Back then it was called “embossing”. Grills, or embossing, are basically nothing more than the name suggests; that is an embossing applied to a paper item by means of a roller that is pitted with the necessary depressions that will create this embossed image. The embossing (or female”) roller receives its pitted impression from a knurl, or series of raised pyramids (which are referred to as “points”) on the “male” roller. When the female roller makes its impression on a sheet of stamps, the result is that a grill, or embossing, is evident. The main concept of grilling stamps was such that the process would break the fibers of the stamp paper to such an extent that the canceling ink would soak itself into this broken area in such a manner as to render cleaning the stamp an impossible task. The paper itself is not broken, or “cut”. It pertains only to the fibers. Patent No. 70,147 was awarded to Charles F. Steele of Brooklyn, New York on October 22, 1867 for his grilling device and the rest, as they say, is history. The government conducted several experiments with grills. One of the first of these featured a small shield design intended to replace the central portrait of the stamp. This small shield contained a raised colorless numeral “3”. The central area, excepting the numeral, was grilled. 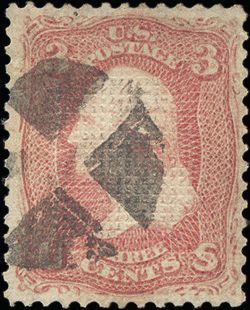 The frame design selected for this experiment was the 3-cents Washington of the 1861-1866 Series. 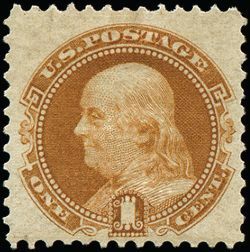 Examples of threes test (essay) stamps are very rare today. Various experiments were carried out through much of 1867until the Post Office Department fi nally settled on what we are familiar with today as the Grilled Issues and the printing and sale to the public were hastened. Now we’ll focus our attention on the relatively easy method of identification. We often hear the terminology “Points Up” or “Points Down” when the subject of grills is discussed. “Points Up” refers to the embossing being from the bottom of the stamp paper so that the raised pyramidal shapes are on the face side of the stamp, or pointing up. “Points Down” is exactly the opposite. Grills are further identified by letters of the alphabet and it is believed by many that they were issued in this order; A, B, C, D, Z, E and F for the 1867-1868 printings, then G for the 1869 Pictorial Issue, followed then by H and I for the 1870-1871 National Issue. Scott No. 83. 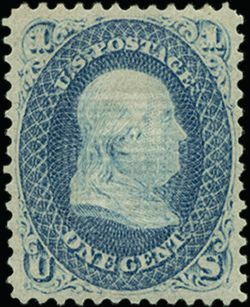 The C Grill on the three-cent 1867 issue. Scott No. 85B. The Z grill on the two-cent Black Jack. It is likely that the A, B and C grills were grilled one sheet at a time. The others may very well have been produced in this manner but it is more likely that they were grilled five sheets at a time which may explain the fact that the grills on some of these stamps are very clear while on others they are faint or barely noticeable. Scott No. 92a. The F grill on the one-cent issue. Scott No. 111. 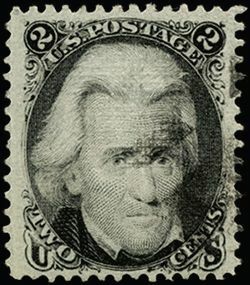 The one-cent stamp of 1869 with G grill. Scott No. 100. 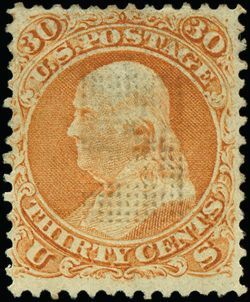 The F grill on the 30-cent stamp from the 1867 series. The alphabet letters indicate a certain measurement, always in millimeters (mm) of the width and length of the raised (or “grilled”) area of the stamp. I have found it best to measure from the bottom of the stamp so as not to be confused by the stamp’s design or cancellation. The following handy table provides these grill counts. Pat Herst once told me that Lester Brookman gave him this tip to simplify the identifi cation process. To make the tips of the pyramids show up, take an ordinary #2 lead pencil, turn the tip sideways and mark up a small area on a piece of scrap paper. Then rub the tip of your index finger over this area until the finger tip is covered with carbon. Then place the used stamp on a flat surface bottom side up. suited for grills with “Points Down” rather than for grill types A, B or C. The tips of the pyramids will pick up the carbon from your fi nger tip and will thus become more plainly visible. Once the task is completed, I use a simple “bath” in warm (not hot) water with just a drop of dishwashing liquid to make the stamp presentable once again. This technique is not necessary for those grills with “Points Up” as the grill points should show up clearly anyway. Do NOT use this carbony technique on unused stamps that have any part of gum remaining. I have also found that an well-accomplished immersion in watermarking fluid helps bring out the grill area in a more evident manner. A closing word is in order on fake grills as they pertain to unused stamps with gum. As indicated in Steele’s patent, the embossing was understood to be performed after the gumming of the stamps. If you have an unused grilled stamp with gum, check the points very carefully to detect if there is any residual gum. A gum spillover of this type is the simplest means of detecting a regumming job. Remember the process; gumming, embossing (or grilling) and then printing. As always there is no substitute for knowledge. And, it should go without need for mention but we’ll do it anyway. Always deal with a trusted and well established dealer, preferably one who holds a membership card in The American Stamp dealers Association.